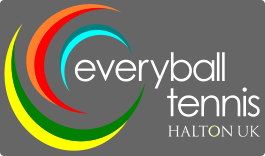 Here at Everyball Tennis, we have a fun and progressive way of inspiring children to learn and develop new skills as they become players of our fantastic game through our Mini Tennis Red Awards Programme. Our coaching team seamlessly weave the outlined skills at each award level (1 to 5) into all our sessions and recognise and award children as they progress at their own speed and time with a medal, certificate and post-card home. To avoid unnecessary anxiety there is no pressure or test involved and children can be awarded a level at any point during the term or year. This does not mean that a child moves immediately into a new group - the progressions between awards are subtle (small increases and development in court size and skills) to enable coaches to work with up to two levels in one group session. Our entry level award as children come to tennis as a new activity or as they progress out of our tots programme. Ages 4-5 years. Ages 4-6 years as the fundamental skills are enhanced. Ages 5-7. The first significant increase in court size challenges our youngsters further as they are in touching distance of playing the full game of Mini Tennis Red! Ages 6-8. Now playing the game on the full-red court, and children can progress onto the Orange court from this level at 8 years old. Ages 6-8. The very sharp end of Mini Tennis Red - the summit if you like! Caution however, this is the summit of a low mountain range, there are far greater peaks to climb as the tennis journey continues!